Gyeon Applicator Foam Block helps you apply your favorite coating with ease. When applying coatings, you want to make sure you are using the correct tools for the job. The wrong applicator can soak up too much products, causing streaks, or even marr the surface. With the Gyeon Applicator Foam Block, you can safely and easily apply all Gyeon coatings (i.e. Prime, Gyeon Mohs) and other coatings on the market as well. This applicator is made out of foam, but features two unique layers. A firm top layer allows you to easy grip and maneuver the block, while the thin lower layer features a softer open celled foam, that flexes to meet every contour of your vehicle. Wrap the block in a Gyeon Microfiber Suede and you will enjoy how easy it is to apply a nice thin layer of coating! i.e. 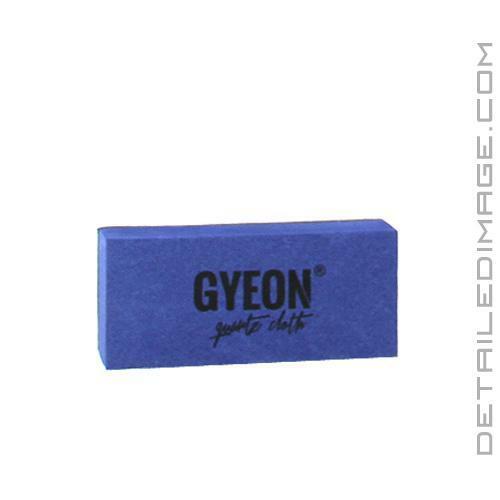 This Applicator Foam Block Microfiber Suedes are the same units included in various Gyeon coating kits. These applicators are great. Very little mess as they soak up product but dispense it out perfectly. I used this with the tire shine with excellent results, but they have come in handy applying various things not car related tool. I would like to by a ton of these.